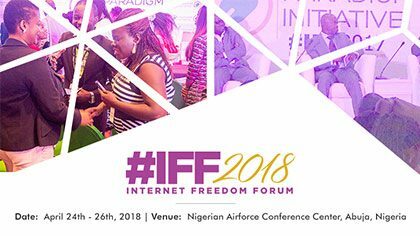 On Thursday April 26 at 10:30am Chioma Agwuegbo will speak on the topic of digital inclusion as a right at a panel at the Internet Freedom Forum in Abuja, Nigeria. Sponsored by the Ford Foundation, Google, Facebook, and others, the event will bring together civil society organizations, policy makers, and tech enthusiasts to discuss emerging issues of internet freedom in Africa. Follow along at #IFF2018.